Just a quick post today before I hit the hay. I need my beauty sleep for an exciting event I'm attending tomorrow! You'll have to stay tuned for the post about it for all the details, but I will say that it involves cake :D So excited right now, how will I ever sleep?! Before burying myself in the warmth of my bed covers, here are some photos of the cupcakes I made this week for a colleague. 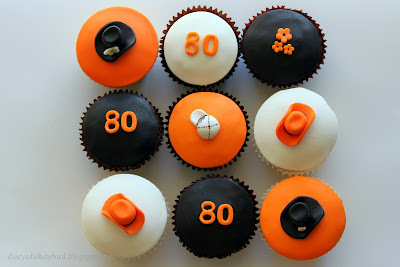 It was her father's 80th birthday, and seeing as her father loves hats, it seemed only fitting to incorporate hats into the theme for the cupcakes. I thought about what sort of hats to create. I mean, there are so many, right? Berets, sombreros, beanies.. they're all hats, but would they make good cupcake toppers?? Perhaps. In the end I settled on cowboy hats, baseball caps and top hats for the occasion. All in keeping with the black, white and orange colour palette for the 50 cupcakes in total. Yes! 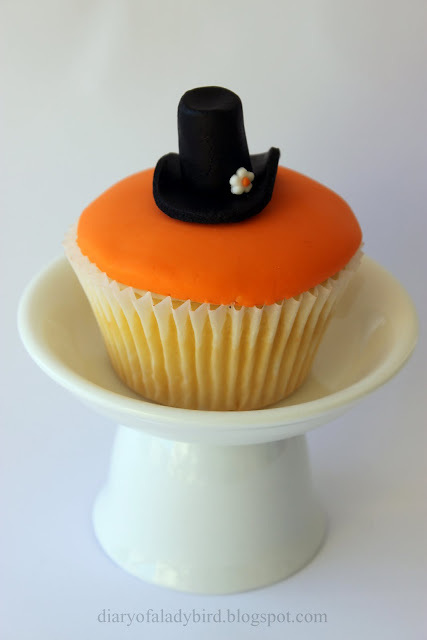 An individual cupcake stand :) Cute, n'est pas? 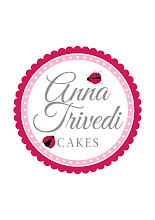 I'll be showing you how to make your own individual cupcake stands at home very soon, so stay tuned, my lovelies! SUPER cute! Where did you get the individual cupcake stand. I think I need to move house so I can buy more stuff!! Ngawww....I love the individual cupcake stand!! And I love the cupcakes too! 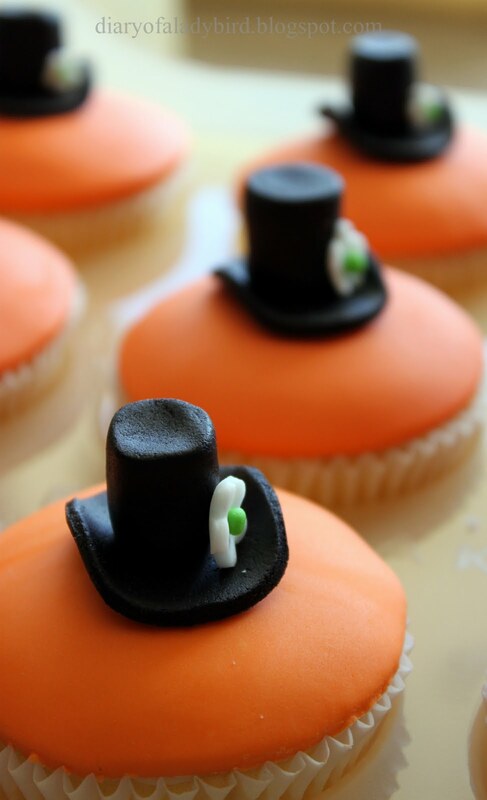 Especially the tophat =D You're so good with fondant! So cool!! The hats are just perfect, and I love how striking this colour combination is too. 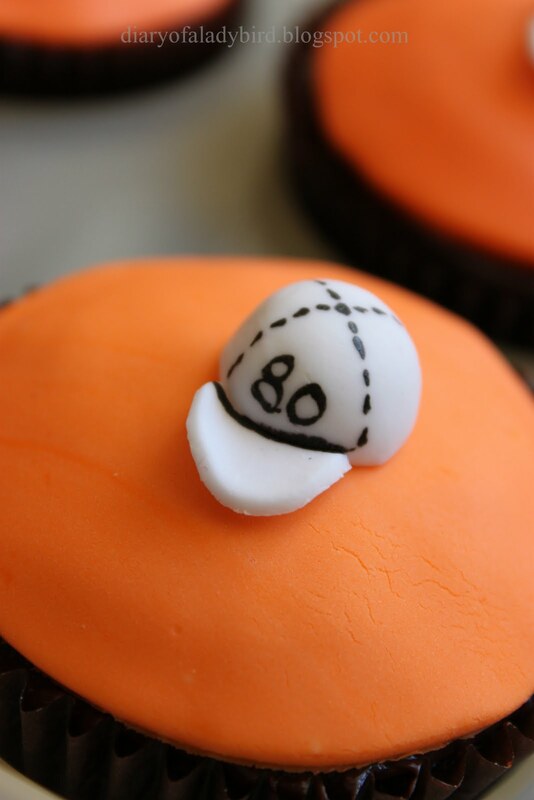 If the Tigers win the premiership, I want you make these for me !!! 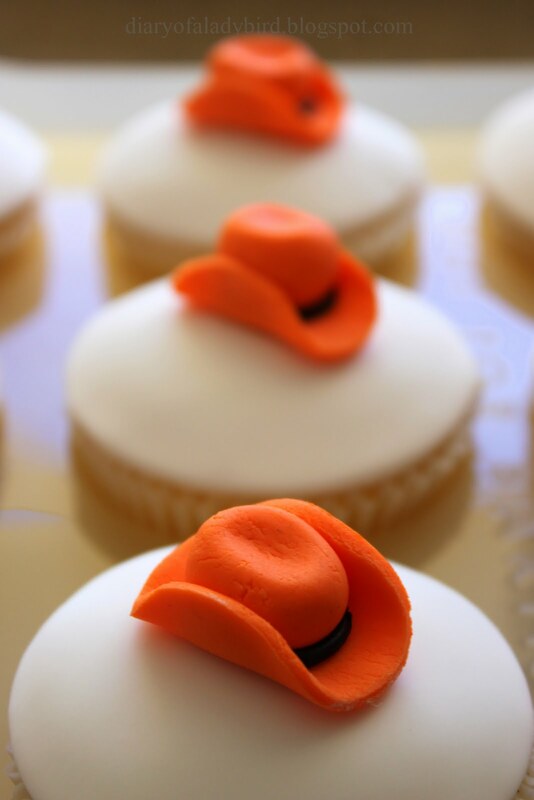 Very good cupcakes. Your work is very good. I am proud of u.